The weather is just starting to break…I do believe the snow is over (hope I am not jinxing it)…so it is time to think GREEN! So we thought a little collection of Fabulous Farmhouse Style Upcycled Gardens were in order. So get ready to be Inspired …you will find Gardens on Ladders…in Wagon Wheels…on Bikes and so much more! You will even find the perfect Garden Angel and a Watering Can that pours Crystals! Add a bit of whimsy to your Garden…a smile…an of course your own personal flair! These DIY’s and Inspirations are going to give you some great ideas and technique! So sit back out on your deck…chill out with a tall glass of Strawberry Lemonade and have fun looking at all of these little Garden Wonders…I have a feeling you will be adding something awesome to your own Garden soon! There are many amazing upcycled projects made with an old door…but I have to say that this is my favorite. Laura over at Finding Home Farms out did herself with this fabulous Herb Garden. 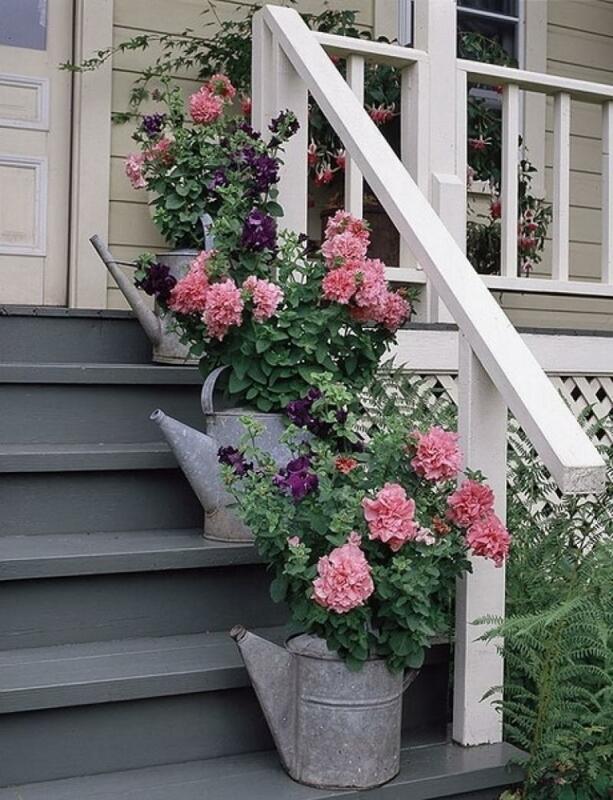 The galvanized buckets and vintage china just make this creation absolutely amazing. 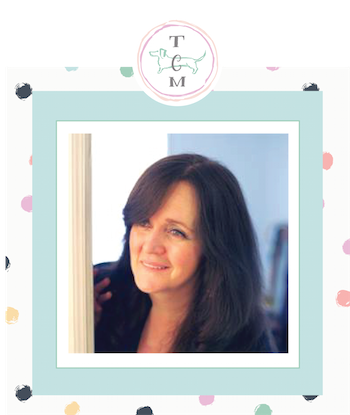 Come and see how Laura made this beauty and be inspired. 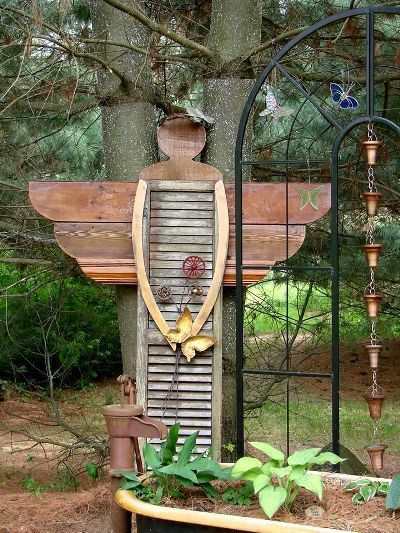 Every Garden needs an Angel…so why not whip up a heavenly one by upcycling an old shutter! Come on over to Flea Market Gardening for the DIY! 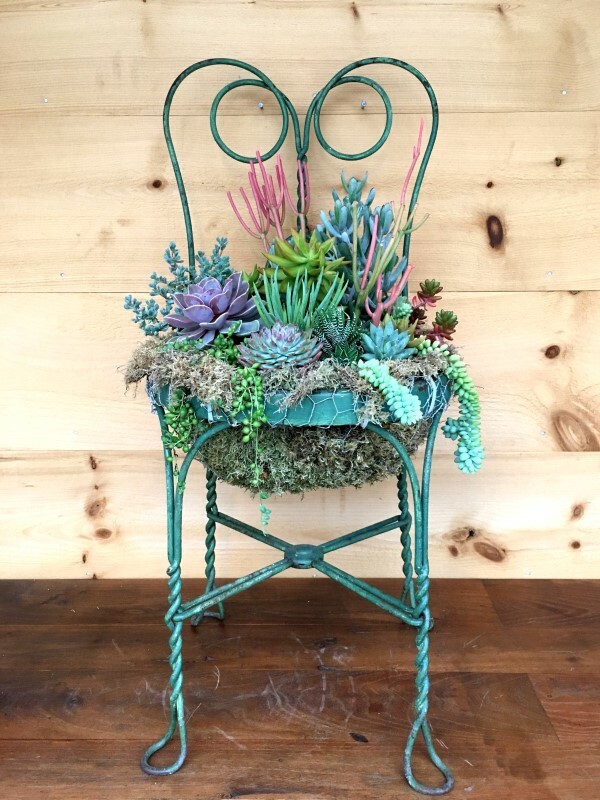 Come and watch a vintage chair become a beautiful Succulent Planter…are you in love with this or what! Check out the DIY over at Garden Therapy and you can take what you learn and apply it to a fabulous chair find of your own! 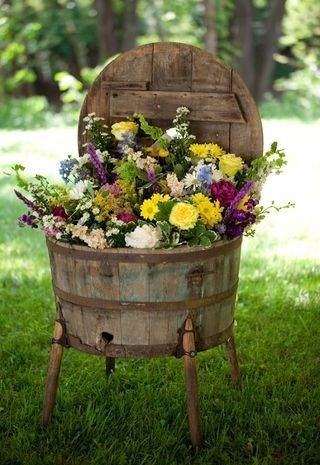 Did you know that some wood and old drawers can be made into an awesome planter like this one? 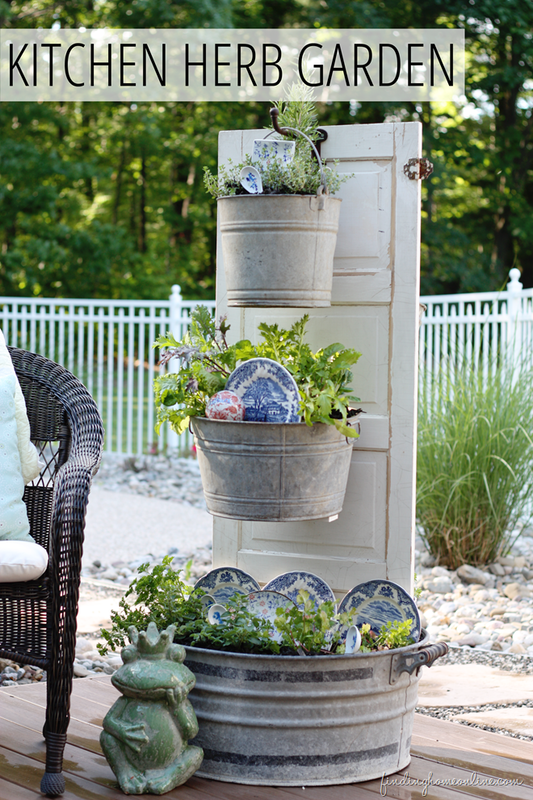 How great would this look on your porch…garden…patio or deck. Well the DIY is over at Beyond The Picket Fence…give it a try…you will adore it! This has got to be the coolest thing you could do with a Wagon Wheel! 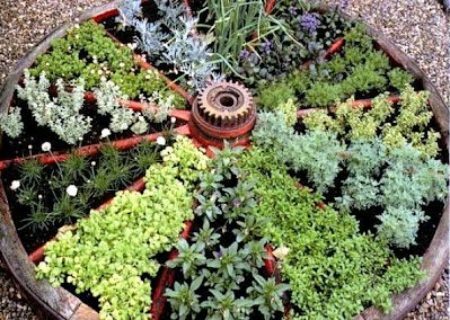 Who wouldn’t want a Wagon Wheel Herb Garden! See how you can turn one of these rolling beauties into a YUMMY Garden : ) The DIY is over at the Whoot! Every Garden needs to be watered…so why not with beautiful crystals! Over at Crafts By Amanda there is a video waiting for you…it will show you how you can make one of these pretties for your very own garden. 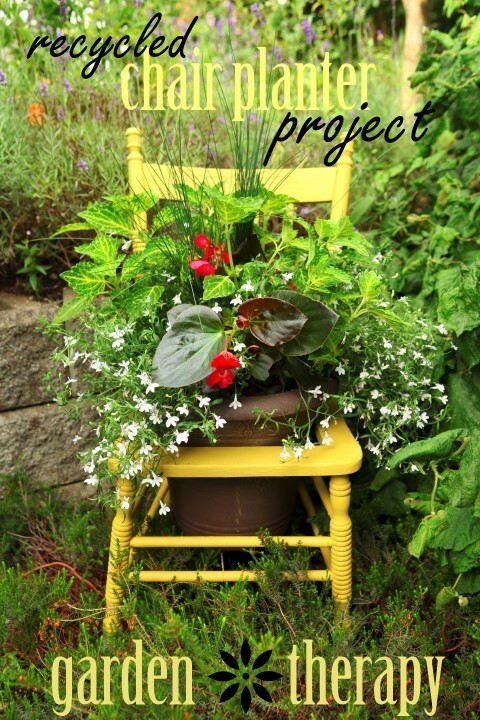 Garden Therapy is at it again with yet another incredible Upcycled Chair Garden. This project will have you on the look out for the perfect chair at your local Thrift Shop. See how it is done…I have a feeling that there is a gorgeous Chair Garden in your near future. 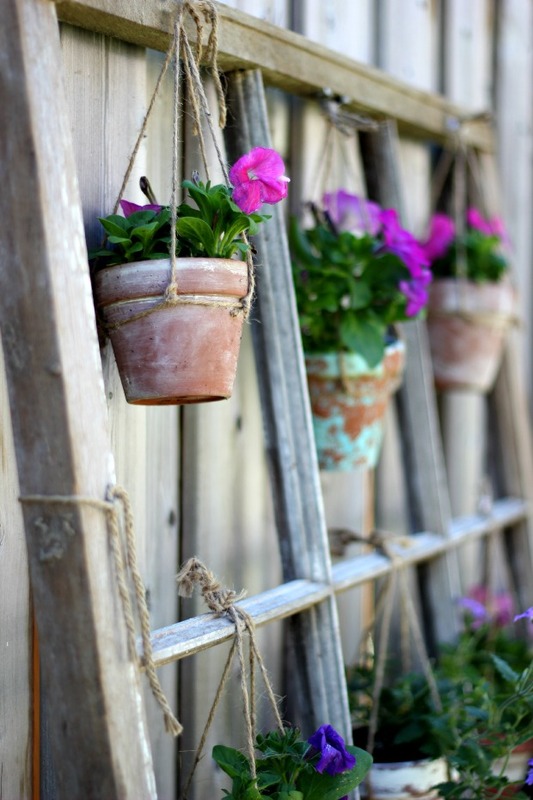 Come and see how Lucy over at Craftberry Bush upcycles an old window frame into a gorgeous Garden! Love love love this. Kelly over at Kelly Elko is kind of an Upcycling Garden Wizard! Really. She turns the most unlikely pieces into gorgeous gardens. 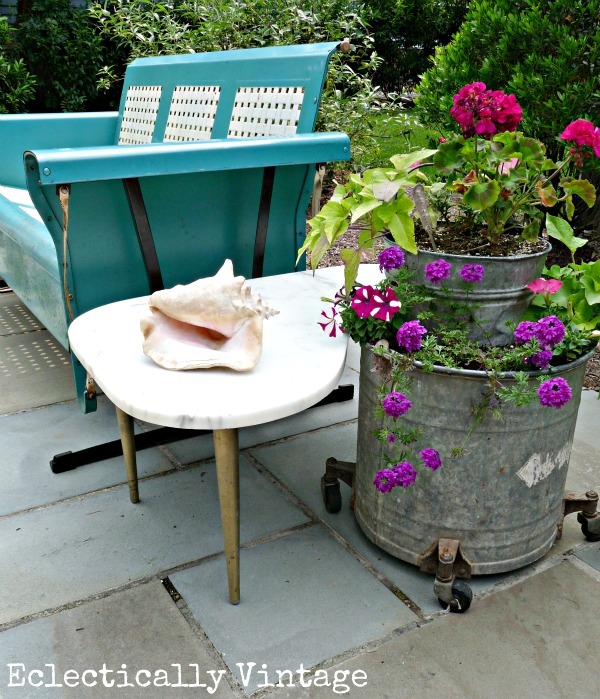 Just look at this old Mop Bucket…it is now the star of her eclectic Patio. Come and visit and you will find a vintage Tool Box Planter and more. Be Inspired! 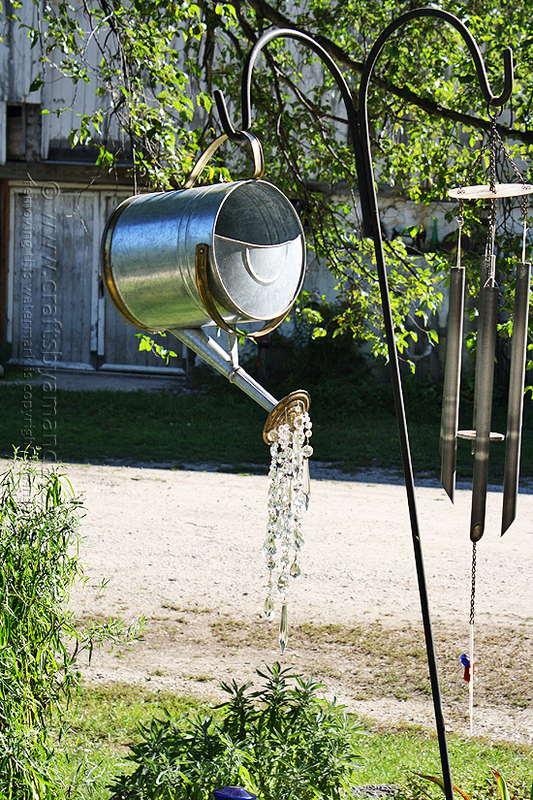 Something a simple as a Galvanized Watering Can can be upcycled into a planter that is totally breath taking. Check out Home Est for more inspiration. 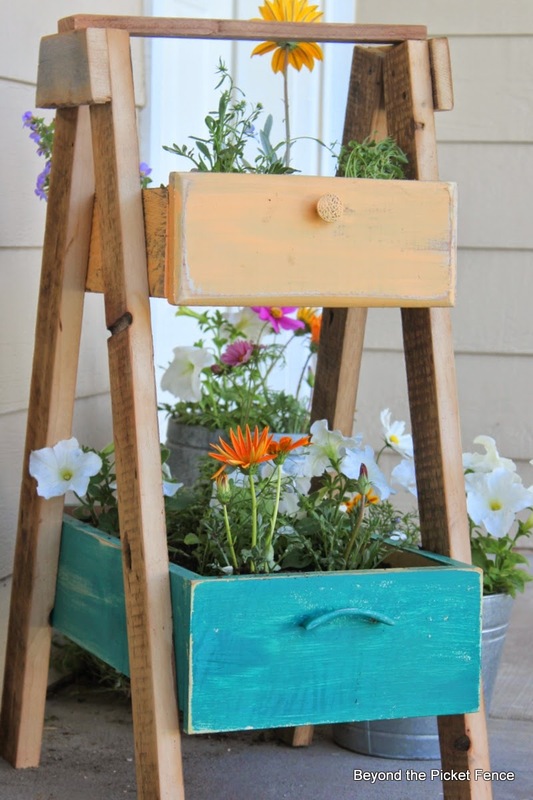 A wooden bucket can be transformed into an amazing planter buy just adding some legs! 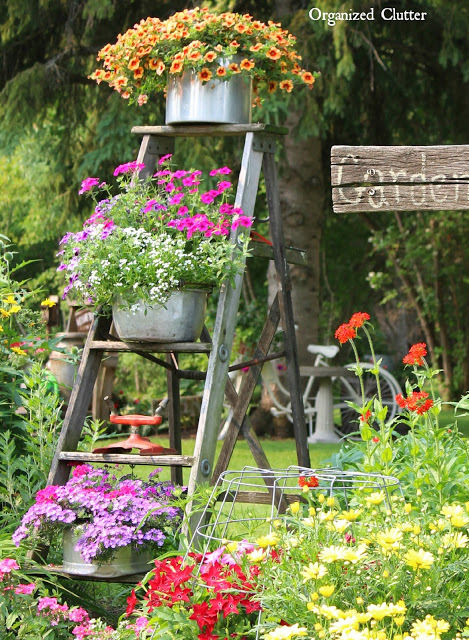 There are tons of upcycling garden ideas waiting for you hover at Hit DIY. Tons of inspiration. 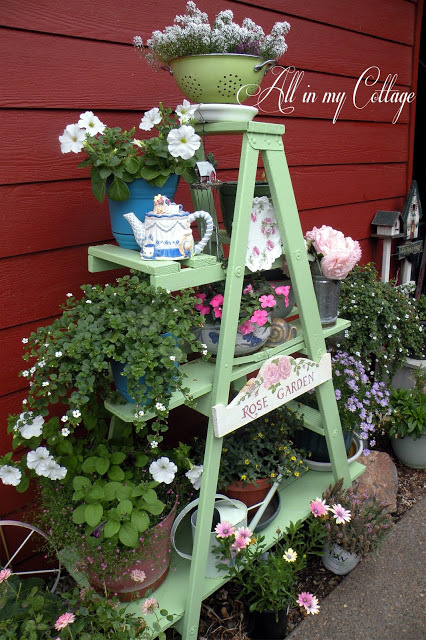 Can you believe that all it takes is an old ladder…a few shelves and some paint to create a Garden Masterpiece. Just look at this one over at All In My Cottage. Does this inspire you or what! Here is yet another upcycled ladder DIY…come and see how House Of Hawthornes build this beauty step by step…how fabulous does this look in the garden! You can do it do in no time at all. Keep checking out the Thrift Stores for perfect containers that make your creation even more personalized. This pin shows us how we can upcycle a tree stump and give it all new life. How wonderful …it’s just like giving back to The Giving Tree! 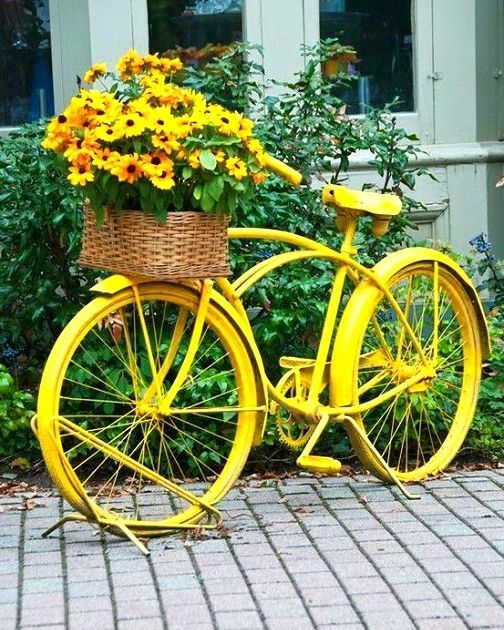 Before you recycle that old bike that can’t be fixed…think planter! A bit of paint…add a basket and VOILA…a little garden on wheels. So sorry I could not find the direct link back to this beauty. Love the log and trunk planters! I love a bunch of these and pinned! 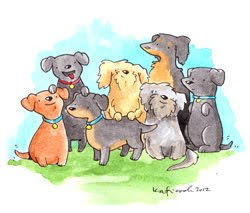 Wish I was the one to think them up!